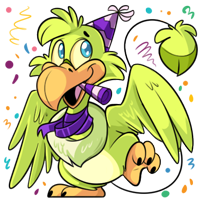 The Party Pets have been enjoying the pinata festivities, and for them it's been like one big party. Several Pets stayed up late last night giving each other makeovers. They had so much fun, they decided to keep the new look, particularly the star of the evening, the Party Dovu. Their friends the Party Makoat and Party Jakrit have also donned a slight adjustment to their facial features, though not a full revamp. If you're having trouble seeing the new images, try pressing Ctrl + F5 (or Fn - F5) to clear your cache.